Samsonite Uplite is a high quality softside luggage collection that is not only extremely light, but also one of the cheaper offerings from Samsonite - which is great news if you want a nice suitcase but not an empty wallet. Softshell luggage has some advantages over hardshell luggage - it is usually much lighter, and comes with a handy external compartment. This is true for the Uplite suitcases as well, but there are so many other awesome features that you need to know about. Do You Need The Samsonite Uplite? 19.57" x 13.39" x 7.2"
25.0" x 16.73" x 8.46"
27.76" x 18.9" x 12.2"
22.44" x 13.98" x 9.84"
25.98" x 17.13" x 11.02"
30.31" x 18.9" x 12.2"
This luggage comes in three classic Sasmonite sizes (20, 24 and 29 inch). In terms of air travel, you could use the smallest suitcase as a carry on, but you would have to check either of the larger two. However, you should definitely check what the maximum carry on dimensions for your airline of choice are, since the overall height of the smallest Uplite exceed 22 inches. Other than that, you can notice that this luggage is available in a few different colors. There is not a lot of color variety, but there is some. But, that's not even remotely as important as the weight of these suitcases is - with only a little over 6 lbs for the largest suitcase, this is some of the lightest luggage ever from Samsonite. Even though I generally don't use softshells for air travel, that rule doesn't apply to the Uplite collection. And not just because of their light weight - these suitcases are equipped with some amazing features that you usually don't see on softshell luggage. So, let's check out what those are! Materials are always very important. The durability and strength of your luggage depends on the type of material that it's made from, and it's a good thing that these Samsonites are made of nylon. That is one of the most used fabrics in all types of luggage, precisely because it is really durable, strong and water resistant. One advantage that softshell luggage has over hardshell luggage is that you don't have to worry about scuffs and scratches. But, you do have to worry about some other things, especially with the larger two suitcases. There is one reason why people avoid checking softside suitcases - they could easily get deformed. They are nowhere near as impact resistant as hardshells, and you need to think about baggage handlers throwing your luggage, and then throwing other bags on top of it. As long as you don't pack breakables, or put them at the bottom (or protected inside other clothes) you are usually good to go. But just be aware of this downside. This is the first feature of the Uplite luggage that you don't often see on softshells. And one of the reasons why this collection stands out from so many others. Spinners are wheels that can turn 360 degrees each, which means that you can roll your suitcase while it is upright (not tilted) and then push it in any direct. This gives you great deal of maneuverability. 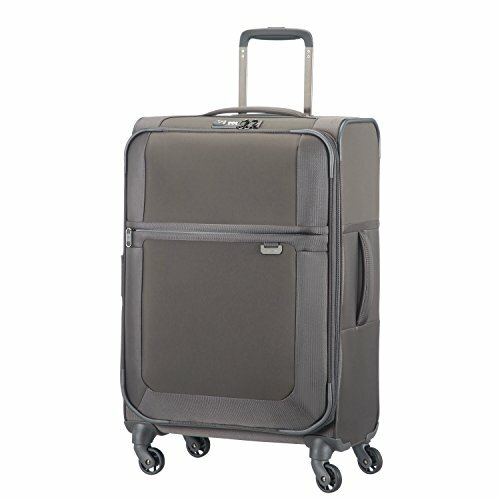 One more thing to note is that the Uplite luggage features single spinner wheels. These are lighter than the double ones, but also slightly less durable. 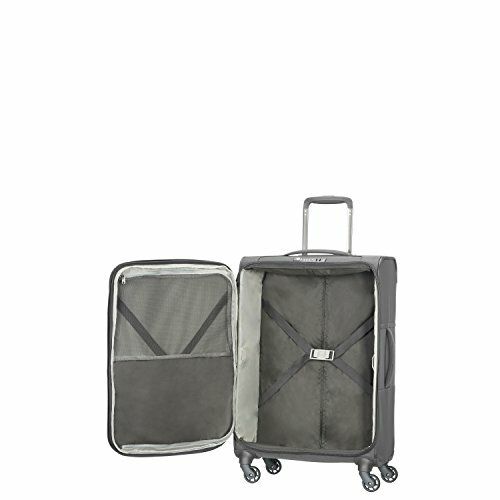 However, these suitcases are also equipped with protective corner guards that will keep your wheels safe when in the tender hands of the airline (cough cough). Obviously, you're going to have two types of handles on a suitcase. There's the retractable main handle, which is telescopic and locks into position with a push of a button (both when fully extended and when stored). Unfortunately, you can't adjust the height of this handle, so not all of you will be able to make it fit your height perfectly. However, given you normally don't walk for miles with a case, it should not be an issue. 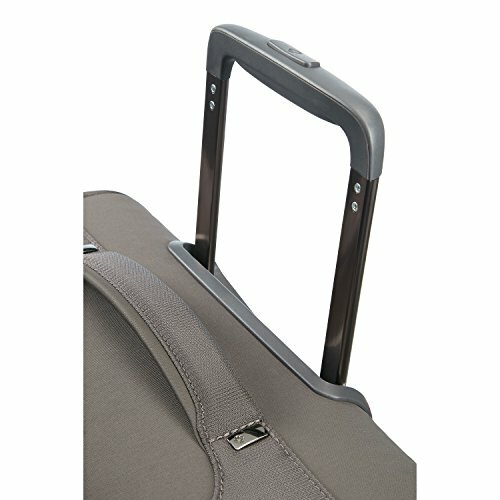 The other type of handles are carry handles - you know the ones you use when you have to pick up your suitcase. There are two of these on the Uplite luggage - one on the top, and one on the side. The carry handles are reinforced, and they should feel pretty sturdy in your hands. And they are padded so they should feel comfortable. The only thing that I don't like about them is that they aren't rubberized, because rubberized carry handles mean a very firm and stable grip. However, these normally only come on the more "expensive" models from Samsonite. Yes you read that right. And this is the most impressive feature for me, as it is super are to see on a softside suitcase, let alone a TSA friendly lock. The lock on this suitcase is a 3-digit combination lock, and you can set up the combination yourself. When you want to lock your suitcase just insert the zipper pullers into the teeth of the lock, press the button and you're done. First of all, if you are going to check your baggage, or part with it at any point, you want to have a lock. It will protect your belongings, and ensure that the bad guys can't get inside your suitcase. A TSA friendly lock will do just that, but it will also let the good guys (TSA agents) in. This applies only to the United States, as they are the ones who have TSA at airports, but the agents often do random luggage inspections. And, if they decide to inspect your suitcase, they can easily unlock it if it has a TSA approved lock. Just like most softshell luggage, the Uplite collection features a large single packing compartment with a lid that has some storage, but not a lot. It is fully lined and pretty spacious, so you should be able to easily fit everything you want inside it. There are elastic cross ribbons with a Smart Fix lock inside this compartment, designed to keep all of your stuff firmly in place. And there's one more thing I really like; there are two little holes on the edges of the compartment. These are designed to hold the cross ribbons while you pack, and I think this is one of the most thoughtful features we've ever seen from Samsonite. It's something that you never really think about, but pretty much need whenever you want to pack. It stops the straps from getting in your way while you pack! 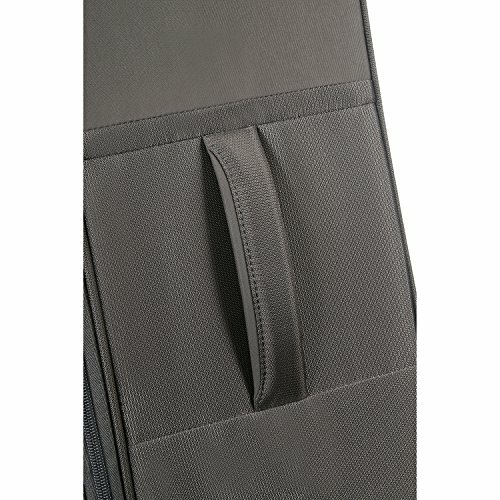 The top flap of the suitcase features two large zippered pockets. They greatly increase the organizational features of the suitcase, as there are no pockets inside the actual packing compartment. Oh and there is one more hidden feature - the capacity of the suitcase is expandable via a zipper on the outside. This will definitely come in handy if you pack one too many items, but also if you like to shop on your trips and bring home more stuff than you left with. One reason why people prefer softside luggage is because it usually has at least one external compartment. With hardshell luggage, you rarely get any external compartments - there are a few Delsey suitcases that have this feature, but most others don't as it is not that easy to incorporate it into the design of the suitcase. The Uplite suitcases are equipped with a single, large external compartment. And it is lockable, so it's perfectly safe for your electronics or other valuables. But the best thing about the external compartment is that it's perfect for any items you want to have handy during your trip. If we're talking about a carry on suitcase, you can stash your ticket, laptop and a book inside it and then access them in a minute when you need to. It's also very convenient for anything you remember to pack last minute, since it saves you from having to open up your suitcase and try to fit something else inside it. You can't adjust the wheel handle. It's not a really big issue, as the height of the handle suits most people, but it's still worth mentioning. 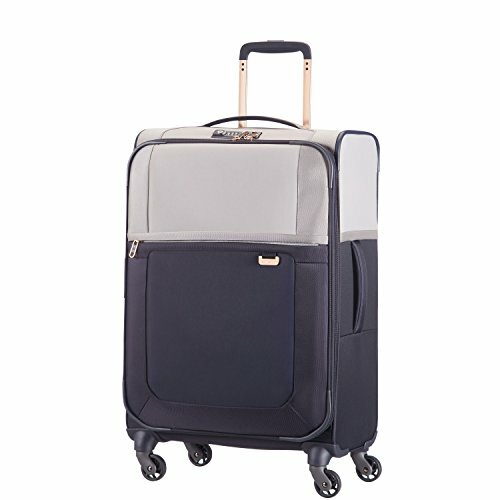 Especially because Samsonite included adjustable wheel handles in many of their other collections, so it is a little disappointing that they decided not to include it in this one. Little color variety. If you like to make a statement with your luggage, then this is probably not the collection for you. You can get it in only three colors, which are kind of dull to begin with. But if you don't really care about the color, feel free to ignore this. Not great as checked baggage. I can't stress this enough - if you are looking for a large suitcase that you plan to bring to a flight, check out some hardshell luggage. Even though this is a pretty durable suitcase, there have been reports of it getting deformed after being handled by airport personnel. So, if you don't want to spend $100+ only to get your suitcase ruined after the first flight, consider getting something like the Samsonite Centric. That's all folks. You can decide for yourself whether the upsides outweigh the downsides, but I really think they do. You will love how lightweight it is, especially because that just means that you can pack more things inside it. And the low pricetag for a Samsonite suitcase! You'll also love that the single spinner wheels roll like a dream and that the retractable wheel handle makes maneuvering them a piece of cake. And not to mention that TSA friendly lock, which will give you some peace of mind about the safety of your belongings. Overall, this is a really good collection from Samsonite, and I think that anyone could appreciate just how much thought went into the design of these suitcases. I would not recommend this luggage only to people who are looking for a sturdy suitcase that they can use to protect fragile or valuable items. In that case, I this you should definitely check out some hardshell luggage, as it is much more adequate for those kinds of luggage. And keep in mind that it's not really just the Uplite that doesn't handle tough love from baggage handlers well, but rather just a general design flaw of softshell luggage. However, if you have 99% clothes in there, you are good to go (I used to travel with only softshells and never had an issue).